Technical and business side of software development. STS (as of version 2.8), by default, uses development environment when deploying a Grails application to server. Usually you would want to deploy your application in production mode instead to get the best performance. 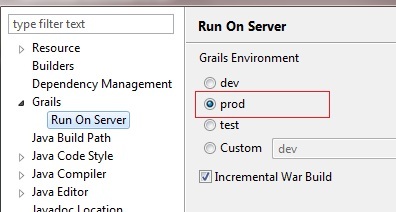 To do this in STS, go to your project properties and navigate to Grails > Run On Server. Change the value from "dev" to "prod". Hope this helps. My website has been deployed in Cloud Foundry for more more than a year and only now I've discovered that it's running in development mode! I knew it wasn't working, because my database was reset after each restart. Thanks for this handy tip!